Add more to timesheets with comments. Ask a question, make a comment, or simply provide more information whenever you like. Sometimes you need to say more than numbers. 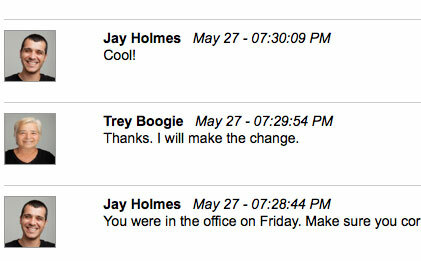 You can add text to a timesheet in the form of a comment. Add a comment to remember what happened that week. Comments read like a conversation. You can easily hold a short conversation with comments. Tell a person something that is not obvious from looking at your timesheet. People are required to add a comment when denying a timesheet, so tell the person why.